OC8 products are clinically proven to control shine for 8 hours. 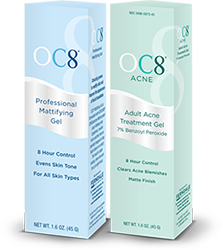 OC8 and OC8 Acne are products of Ferndale Healthcare®, Inc., helping people achieve flawless skin. OC8 has received national media coverage thanks in large part to a strong reputation with professionals in the beauty and fashion industries. OC8 has been profiled in national magazines and beauty blogs like www.youbeauty.com, and used on popular television shows, including American Idol and the Glee Project. OC8's 8-hour formula features ACRYSORB®, micro-particles that trap facial oils to reduce shine and redness for up to eight hours.